Today (April 6, 2016) I was pleased to present “High Class PowerShell” to the SQL PASS PowerShell Virtual User Group. In it I covered the creation of custom objects and classes in PowerShell. The first question everyone asks is “where’s the code”. I’ve pasted the code samples for the main demo at the bottom of this post. You can review it here, or copy – paste into your own ISE. The closing code on calling classes created in PowerShell was discussed in these two blog posts, so I won’t repeat it here. When the video of the presentation goes live I will have a follow up blog post, meanwhile, and without further ado, here is the code sample. This module is Copyright (c) 2016 Robert C. Cain. All rights reserved. is implied or expressly granted. # function to make it easier. $myObject = Create-Object -Schema "MySchema" -Table "MyTable" -Comment "MyComment"
# Each property has it's own .NET Data Type. "`$myObject.Author now equals $($myObject.Author )"
# default set to display. # Note when typing the last : will trigger intellisense! static [string] $Version = "2016.04.06.001"
On September 9th I am co-presenting “Zero to Here with SQL Server and PowerShell” for the 24 Hours of PASS. If you’ve not heard of 24 Hours of PASS, it is 24 straight hours of online presentations. This time the sessions are a preview of the SQL PASS Summit in Seattle, WA in November. At the PASS Summit I, along with two co-workers, am presenting a full day Pre-Con entitled Zero to Hero with PowerShell and SQL Server. I’m also doing a regular session, Make SQL Server POP with PowerShell. The session for 24 Hours of PASS will take place at 00:00 GMT on September 10th, or for those of us in the states, September the 9th, 8 PM Eastern, 7 PM Central, 6 Mountain, or 5 Pacific. The session is titled the same as the precon, Zero to Hero with PowerShell and SQL Server. Through the preceding link you can see more about the session, get to the full schedule, and most importantly register! 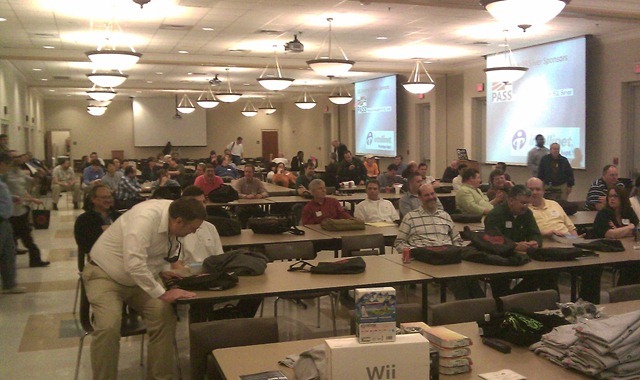 We just finished up our SQL Saturday here in Birmingham Alabama. It was number 29 in the list of SQL Saturdays. First off let me cover some supporting material for the two sessions I gave. The first was an introduction to Microsoft’s new self service BI tool, PowerPivot. Attendees can download my slides here: PowerPivot Slides You can also see all my posts so far on PowerPivot at https://arcanecode.com/category/powerpivot/ or by picking PowerPivot from the drop down over on the right side of this blog. My second session of the day was an introduction to SSIS. Step by step instructions, the sample project, and the slide deck can all be found on my Code Gallery site. At the end we got a bit rushed for time, hopefully some of your questions can be answered from some of my past posts on SSIS. If not feel free to send me an e-mail (rcain at comframe.com or arcanecode at gmail.com) and I’ll see what I can do to help. Attendees of both sessions may also find my Introduction to Data Warehousing/Business Intelligence slide deck helpful to clarify some BI terminology. 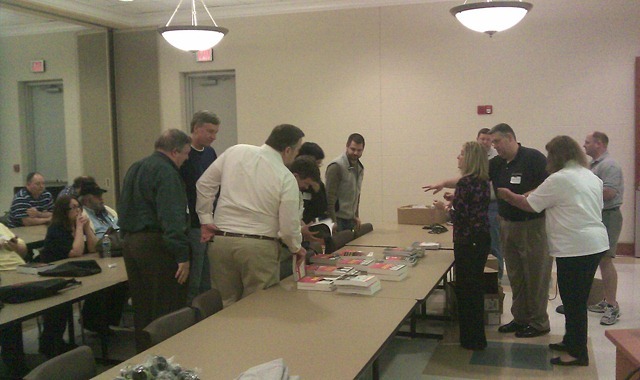 Some lucky winners of books looking over the remaining stack to pick out their prize. John Baldwin, our fearless leader is in the grey shirt all the way on the right. Obligatory crowd shot. Dividers broke this big room down to 4 rooms where we had our sessions. copies of Office and Windows 7, and two copies of the SQL Server MVP Deep Dives book I coauthored. My role in event planning was acting as the speaker coordinator. Finding quality people willing to travel to Birmingham, on their own time and expense, to give presentations. Thanks to Sven Aelterman, Kevin Boles, Louis Davidson, Janis Griffin, Kevin Grohoske, Geoff Hiten, Rodney Landrum, Vincent Mayfield, Aaron Nelson, Barry Ralston, Joe Webb and Jim Wooley. It was their presentations that helped us draw the big crowd we did. Speaking of the crowd, much thanks to all of you who attended. The folks in my sessions were very attentive, asked many good questions, and kept the discussion lively and interesting. I’m glad all of you came and hope to see you all next year. I also would be remiss if I didn’t thank all of our sponsors. Without their donations we would not have been able to put on the event. Microsoft, Teksouth, Bit Wizards, Confio, Redgate, Attunity, Telerik, Intellinet, CozyRoc, Wrox, TekSystems and O’Reilly Publishing and to the SQL PASS organization. I should also give personal note of thanks to my employer COMFRAME, for putting up with my extended lunches and letting me juggle my schedule to run errands and do other planning activities and presentation prep time. Finally a few last thanks and kudos are definitely in order. The first should go to Vito Amato and his merry band of volunteers. They kept everyone in cold drinks, helped the speakers with their needs, answered attendees questions, checked folks in at the door, and in general did everything that needed to be done to keep the event running smoothly. A big thanks and congratulations to John Baldwin, our fearless leader, and his right hand man Morgan Smith for taking the leadership to plan and organize the event. They worked long and hard to make the event the success it was. 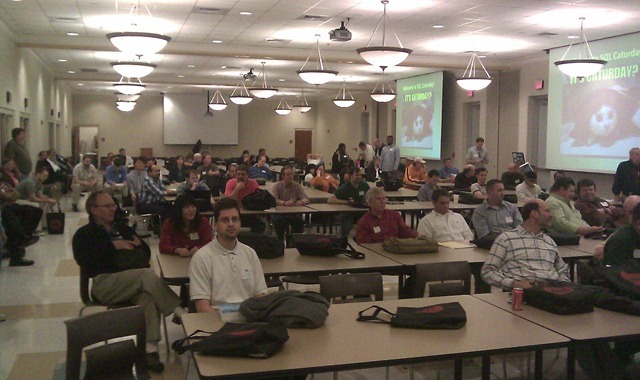 If you want to keep the fun and education continuing, we’d love to have you join us at our monthly user group meetings, http://www.steelcitysql.org/. Thanks for a great SQL Saturday, and I can’t wait for next year’s! I can see from the glazed looks you are giving your monitor that was clear as mud. So let’s step back a bit and first define what exactly is Business Intelligence. Business Intelligence, often referred to as simply “BI”, is all about taking data you already have and making sense of it. Being able to take that information and turn it from a raw jumble of individual facts and transform it into knowledge that you can take informed actions on. In every organization there is already someone who is doing BI, although they may not realize it. Microsoft (and many IT departments) refer to this person as “that guy”. A power user, who grabs data from anyplace he (or she) can get it, then uses tools like Excel or Access to slice it, dice it, and analyze it. This person might be an actual Business Analyst, but more often it’s someone for who BI is not their main job. Some common examples of people doing their own BI today are production managers, accountants, engineers, or sales managers, all who need information to better do their job. Let’s look at an illustration that will make it a bit clearer. In this example, put yourself in the role of a sales manager. You have gotten IT to extract all of your sales orders for the last several years into an Excel spreadsheet. In order to determine how well your sales people are doing, you need to measure their performance. You’ve decided that the amount sold will be a good measure, and use Excel to give you totals. In BI terms, the column “Total Sales” is known as a measure, or sometimes a fact, as it measures something, in this case the sales amount. The grand total sales amount is often called an aggregation, as it totals up the individual rows of data that IT gave us. But now you might be wondering why Andy’s sales are so low? Well, now you want to dig deeper and look at sales by year. In BI terms, the names of the sales people are a dimension. Dimensions are often either a “who” (who sold stuff) or a “what” (what stuff did we sell). Places (where was it sold) and dates (when was it sold) are also common dimensions. In this case the sales dates across the top (2007, 2008, 2009) are a date dimension. When we use two or more dimensions to look at our measures, we have a pivot table. Now we can see a picture emerging. It’s obvious that Andy must have been hired as a new salesperson in late 2008, since he shows no sales for 2007 and very small amount in 2008. But for Paul and Kimberly we can look at something called trends in the BI world. Kimberly shows a nice even trend, rising slowly over the last three years and earns a gold star as our top performer. By being able to drill down into our data, we spot another trend that was not readily obvious when just looking at the grand totals. Paul has been trending downward so fast the speed of light looks slow. Clearly then we now have information to take action on, commonly known as actionable intelligence. So remind me, why do we need PowerPivot? As you can see in the above example, “that guy” in your company clearly has a need to look at this data in order to do his job. Not only does he need to review it, he also has the issue of how to share this information with his co-workers. Unfortunately in the past the tools available to “that guy” have had some drawbacks. The two main tools used by our analyst have been either Excel, or a complete BI solution involving a data warehouse and SQL Server Analysis Services. Excel’s main limitations center around the volume of data needed to do good analysis. Excel has limits to the number of rows it can store, and for large datasets a spreadsheet can consume equally large amounts of disk space. This makes the spreadsheet difficult to share with coworkers. In addition mathematical functions like aggregations could be slow. On the good side, Excel is readily available to most workers, and a solution can be put together fairly quickly. A full blown BI solution has some major benefits over the Excel solution. A data warehouse is created, and then SQL Server Analysis Services (often abbreviated as SSAS) is used to precalculate aggregations for every possible way an analyst might wish to look at them. The data is then very easy to share via tools like Excel and SQL Server Reporting Services. While very robust and powerful solution, it does have some drawbacks. It can take quite a bit of time to design, code, and implement both the data warehouse and the analysis services pieces of the solution. In addition it can also be expensive for IT to implement such a system. Faster than a speeding bullet, more powerful than a locomotive, it’s PowerPivot! PowerPivot combines the best of both worlds. In fact, it’s not one tool but two: PowerPivot for Microsoft Excel 2010, and PowerPivot for SharePoint 2010. What’s the difference you ask? Good question. PowerPivot acts as an Add-on for Excel 2010, and in many ways is quite revolutionary. First, it brings the full power of SQL Server Analysis Services right into Excel. All of the speed and power of SSAS is available right on your desktop. Second, it uses a compression technology that allows vast amounts of data to be saved in a minimal amount of space. Millions of rows of data can now be stored, sorted, and aggregated in a reasonable amount of disk space with great speed. PowerPivot can draw its data from a wide variety of sources. As you might expect, it can pull from almost any database. Additionally it can draw data from news feeds, SQL Server Reporting Services, other Excel sheets, it can even be typed in manually if need be. Another issue that often faces the business analyst is the freshness of the data. The information is only as good as the date it was last imported into Excel. Traditionally “that guy” only got extracts of the database as IT had time, since it was often a time consuming process. PowerPivot addresses this through its linked tables feature. PowerPivot will remember where your data came from, and with one simple button click can refresh the spreadsheet with the latest information. Because PowerPivot sits inside Microsoft Excel, it not only can create basic pivot tables but has all the full featured functionality of Excel at its disposal. It can format pivot tables in a wide array of styles, create pivot charts and graphs, and combine these together into useful dashboards. Additionally PowerPivot has a rich set of mathematical functionally, combining the existing functions already in Excel with an additional set of functions called Data Analysis eXpressions or DAX. PowerPivot for Excel 2010 clearly solves several issues around the issue of analysis. It allows users to quickly create spreadsheets, pivot tables, charts, and more in a compact amount of space. If you recall though, creation was only half of “that guys” problem. The other half was sharing his analysis with the rest of his organization. That’s where PowerPivot for SharePoint 2010 comes into play. Placing a PowerPivot Excel workbook in SharePoint 2010 not only enables traditional file sharing, but also activates several additional features. First, the spreadsheet is hosted right in the web browser. Thus users who might not have made the transition to Excel 2010 can still use the PowerPivot created workbook, slicing and filtering the data to get the information they require. Data can also be refreshed on an automated, scheduled basis. This ensures the data is always up to date when doing analysis. Dashboards can also be created from the contents of a worksheet and displayed in SharePoint. Finally these PowerPivot created worksheets can be used as data sources for such tools as SQL Server Reporting Services. First, let me preface this by saying as of this writing all of the components are either in CTP (Community Technology Preview, a pre-beta) or Beta state. Thus there could be some changes between now and their final release next year. To use the PowerPivot for Excel 2010 components, all you have to have is Excel 2010 and the PowerPivot add-in. If you want to share the workbook and get all the rich functionality SharePoint has to offer, you’ll have to have SharePoint 2010, running Excel Services and PowerPivot 2010 Services. You’ll also have to have SQL Server 2008 R2 Analysis Services running on the SharePoint 2010 box. Since you’ll have to have a SQL Server instance installed to support SharePoint this is not a huge limitation, especially since SSAS comes with SQL Server at no extra cost. One thing I wish to make clear, SharePoint 2010 itself can run using any version of SQL Server from SQL Server 2005 on. It is the PowerPivot service that requires 2008 R2 Analysis Services. One other important item to note: at some point the load upon the SharePoint 2010 server may grow too large if especially complex analysis is being done. Fortunately SharePoint 2010 ships with several tools that allow administrators to monitor the load and plan accordingly. At the point where the load is too big, it is a clear indication it’s time to transition from a PowerPivot solution to a full BI solution using a data warehouse and SQL Server Analysis Services. What does PowerPivot mean for business users? For business users, and especially “that guy”, it means complex analysis tools can be created in a short amount of time. Rich functionality makes it easier to spot trends and produce meaningful charts and graphs. It also means this information can be shared with others in the organization easily, without imposing large burdens on the corporate e-mail system or local file sharing mechanisms. No longer will users be dependent on IT for their analysis, they will have the power to create everything they need on their own, truly bringing “self service BI” to fruition. What does PowerPivot mean for Business Intelligence IT Pros? The first reaction many BI developers have when hearing about PowerPivot is “oh no, this is going to put me out of a job!” Far from it, I firmly believe PowerPivot will create even more work for BI Professionals like myself. As upper management grows to rely on the information provided by PowerPivot, they will also begin to understand the true value BI can bring to an organization. Selling a new BI solution into an organization where none currently exists can be difficult, as it can be hard to visualize how such a solution would work and the value it brings. PowerPivot allows BI functionality to be brought into an organization at a low development cost, proving the value of BI with minimal investment. Thus when there is a need to implement a larger, traditional BI project those same managers will be more forthcoming with the dollars. Second, as users pull more and more data, they are going to want that data better organized than they will find in their current transactional business systems. This will in turn spur the need to create many new data warehouses. Likewise the IT department will also want data warehouses created, to reduce the load placed on those same transactional business systems. I also foresee PowerPivot being used by BI Pros themselves to create solutions. The database structure of many transactional database systems can be difficult to understand even for experienced IT people, much less users. BI Pros can use PowerPivot to add a layer of abstraction between the database and the users, allowing business analysts to do their job without having to learn the complexity of a database system. BI Pros can also use PowerPivot to implement quick turnaround solutions for customers, bringing more value for the customer’s dollar. When a BI Pro can prove him (or her) self by providing rich functionality in a short time frame it’s almost always the case they are brought back in for multiple engagements. PowerPivot also provides great value to BI Pros who are employed full time in an enterprise organization. They can create solutions much quicker than before, freeing them up to do other valuable tasks. In addition PowerPivot solutions can provide a “stop gap” solution, pushing the date at which the organization needs to spend the dollars for a full blown BI solution and allowing IT to plan better. Finally I see great value in PowerPivot as a prototyping tool for larger BI projects. Now users can see their data, interact with it, analyze it, and ensure the required measures and dimensions are present before proceeding with the larger project. I’ll reiterate, if anything I believe PowerPivot will create an explosion of work for the Business Intelligence Professional. Thanks for sticking with me, I know this was a rather long blog post but PowerPivot has a lot of rich functionality to offer. While PowerPivot is still in the CTP/Beta stage as of this writing, I see more and more interest in the community, which will continue to grow as PowerPivot moves closer to release. I hope this post has set you off on the right step and you’ll continue to come back for more information. I’m a big fan of the Kimball method of Data Warehousing. A common task most of us setting up a new Data Warehouse face is creating a Date Dimension. In their book, “The Microsoft Data Warehouse Toolkit With SQL Server 2005 and the Microsoft Business Intelligence Toolset”, they have an example of a good date dimension table in their books sample code. My complaint though was not so much with the layout itself, I liked it and found it fairly complete. Instead it was the method they chose to load it. They used an Excel spreadsheet, then a SQL Server Integration Services package to read the Excel file and load the date dimension table. To me this approach has a couple of drawbacks. First, if you are doing all the loading on the server itself, you may not have Excel loaded. Thus you may be faced with the headache of creating the sheet then figuring out how to get it to a location the server can read. Second, when you go to add more dates in the future, you have to go into the spreadsheet and reset everything, removing what was there before. It can also be quite a headache to go back several years from know and find both SSIS packages and that Excel spreadsheet. Plus after that time changes may be made to both Excel and SSIS that make that solution no longer workable. Finally quite often it’s a DBA setting up the warehouse, and I’ve found there are still a few DBAs who are uncomfortable relying on SSIS, although I’m happy to say that number continues to shrink. A T-SQL solution was clearly, to me anyway, the superior answer for both ease of use and long term stability. I assumed that as popular as the Kimball method is, someone would have already created a routine to load their style of date dimension, but some Binging and Googling around proved fruitless. I did find some code for loading some very simple date dimensions, but nothing as complete as the Kimball design. So, relishing a good coding challenge, I rolled up my sleeves and went to work. Below is the fruit of my labor, a script for loading a Kimball like date dimension. All you have to do is set the begin and end dates, indicate the offset for your fiscal year, and let ‘er rip. You can easily go back and add more dates by just adjusting the begin and end times. A few things you should note. First, I did make a few slight modifications to the standard Kimball date dimension table as found in the previously mentioned book. They have a column titled “DateName” which holds the date as a string in YYYY/MM/DD format. As long as I was putting the date in, I decided to add string versions of the date for the US and Europe. These are in MM/DD/YYYY and DD/MM/YYYY formats and the columns are named “DateNameUS” and “DateNameEU” (for European Union) respectively. Their table also had an audit key, used presumably by the SSIS package. I didn’t really see the need for an audit key for a date table, so I changed it to an identity column so I could have a secondary surrogate key if I needed it, just something to count the number of date rows easily and track the order they were inserted in. One final, but very important distinction. I was in a post conference session taught by Erik Veerman at SQL PASS 2009. In it he mentioned using Dim and Fact schemas, thus you’d have [Dim]. [Date] instead of [dbo].[DimDate]. I liked the idea as it was something I’d been considering myself, so in this version that is what I did. If you use the more traditional naming format of dbo.DimDate you’ll need to tweak the code. Below is the code to load the Date Dimension table, which is my creation. Under it I placed my modified version of the Kimball Date Dimension table. It’s core code came from the sample code mentioned in the first paragraph then was modified by me. I include it for completeness. Update: A few readers aptly pointed out I’d missed replacing a static date field when I worked the final version of the code. Made the change to replace the static date with @DateCounter. Code Sample 1 – Script to load a date dimension. -- it will simply produce errors if you attempt to insert duplicates. -- new dates to the table every year. -- happens as the while loop never executes. -- These two counters are used in our loop. -- begins July 1, put a 6 there. -- begins in July of 2009, put a -6. Code Sample 2 – Modified Kimball code to create a Date dimension.